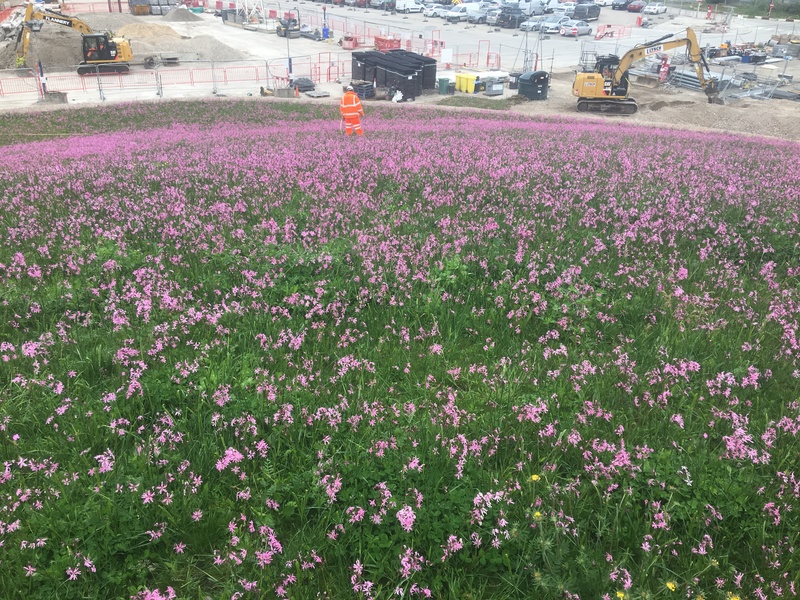 Hampshire-grown wildflowers have recently commuted to London, playing their part in the regeneration of Canning Town as part of London’s ambitious Crossrail project. A beautiful wildflower meadow supplied by wildflower experts Wildflower Turf Ltd is now capping a maintenance and escape shaft for the Elizabeth line on the Limmo Peninsula. Overlooked by high-rise developments and next to the River Lee, the peninsula was Crossrail’s primary worksite for their eastbound tunnel boring machines, and the area adjoins Canning Town Tube and Docklands Light Railway station. Working with landscaping partner Turney Landscapes Ltd, Wildflower Turf Ltd was commissioned by CSJV – the Costain Skanska Joint Venture responsible for the turning the former construction site into the permanent Elizabeth line access shaft - to provide a biodiverse solution that will provide local workers and Canning Town residents alike with a temporary landscape that is both aesthetically pleasing and ecologically-friendly. 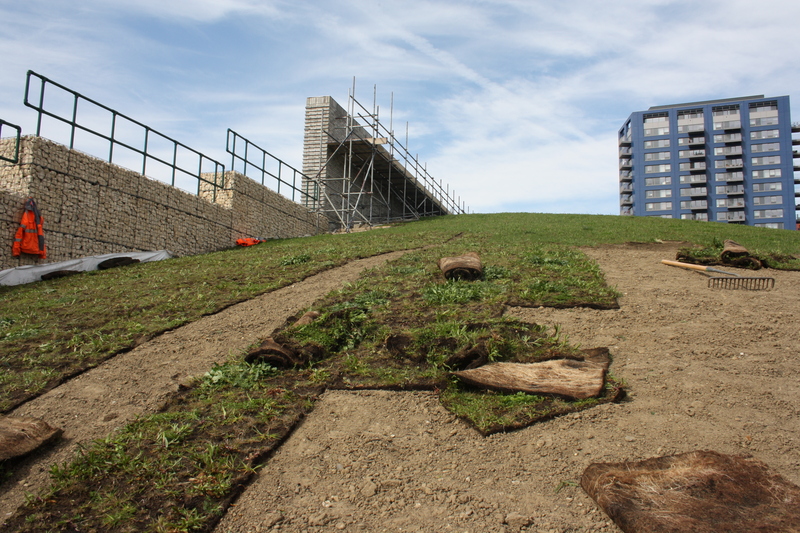 Turney Landscapes installed 2,600m² of Wildflower Turf Ltd’s Roof Turf in March and April of this year, across and down the sloping 8-metre-high exit shaft. Despite the challenging landscaping conditions, the turf is already flowering with the wildflower meadow providing a spectacular display of colour. 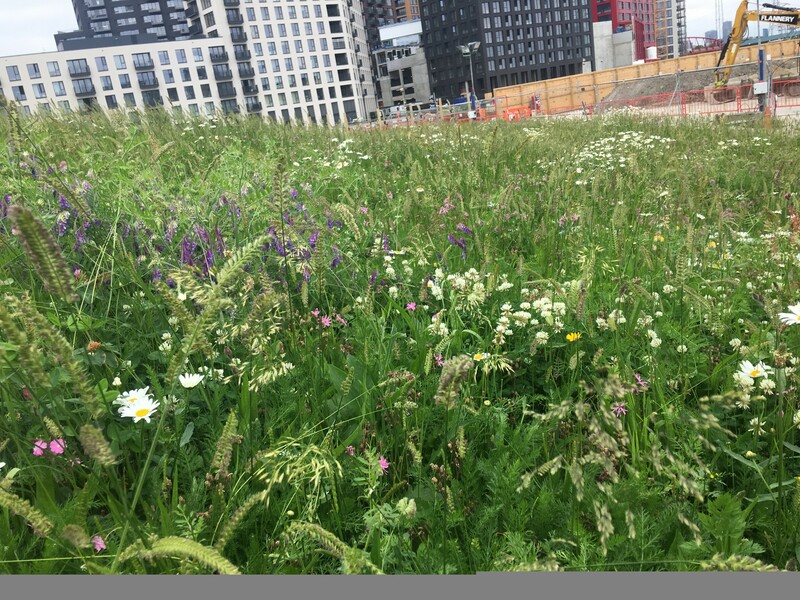 Wildflower Turf is recognised as the leading organisation in the UK for those seeking knowledge or products to develop wild flower spaces. Founded in 2003, Wildflower Turf Ltd pioneered a soil-less growing system which has transformed the reliability of establishing wild flower meadows. The company has a range of Wildflower Turf products to create and enhance a low maintenance, biodiverse and beautiful meadow. The Turney’s Group is a successful and respected family-run business providing quality construction and landscaping services for over 35 years. The Group provide services to local authorities, housing associations, schools, colleges and major construction companies and offer a complete, bespoke service encompassing site clearance, soil preparation, turfing and planting. This press release was distributed by ResponseSource Press Release Wire on behalf of Wildflower Turf Ltd in the following categories: Health, Home & Garden, Environment & Nature, Business & Finance, Travel, Media & Marketing, Farming & Animals, Manufacturing, Engineering & Energy, Transport & Logistics, Construction & Property, for more information visit https://pressreleasewire.responsesource.com/about.